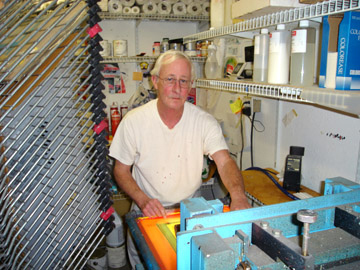 Pro-Mark is and continues to be the industry standard in model graphics since its beginning in 1995. Customers from around the world using Pro-Mark products have won every major scale event numerous times in the last decade: Top Gun, Scale Masters, AMA Nat’s and the World Jet Masters just to name a few. Pro-Mark’s founder, Jerry Caudle is a 3 time Top Gun Champion and a 3 time World Champion, winning high static awards at 2 of the most prestigious scale events in the world: 3 at Top Gun and 2 at the World Jet Masters. He was one of a 3 man team representing the U.S. winning 1st place at the World Jet Masters in Germany 1995. Jerry’s F-16 was the first jet to win "Best of Show" at Toledo. His sport jets have won dozens of awards and have been admired for their craftsmanship, finish and attention to detail at jet events for the past 20 years. Pro-Mark graphics were developed from competing in and winning major scale and sport competitions throughout the U.S. and worldwide. Our customers demand professional service, accuracy and quality FUEL PROOF dry transfers. They value Pro-Mark’s combined 32 years of in-house experience. Winning modelers from around the world come to Pro-Mark because we strive and work to help each and everyone solve their individual needs. At Pro-Mark, we take great pride in our attention to detail, our customer service, and our quality products which is why we are the proven leader in the R/C graphics industry. 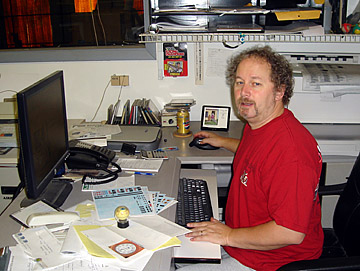 Jeff in our graphics department.